In #2 I said I would tell you what the designer needs to provide to the person who will be constructing the handbag. The more I thought about that the more confusing and out of context I thought that that would become. I decide that I had to do it the way I started out to do in #1. That is, start in the beginning with the basics, and learn it the way I did. Make a paper pattern for the front. Draw a line 1/2" in from the edge where the holes are going to be punched. This is your seam allowance. Fold the pattern in half so that you determine where the center bottom is. This will also show you if your pattern is symmetrical or not. Put a mark on the seam allowance line 3/8" on either side of the center bottom. Those two marks will then be 3/4" apart. Continue making marks 3/4" apart up both sides of the seam allowance line. You will need to have an even number of holes so that when you lace it up, the lace will come out of the top hole on one side and go into the top hole on the other side. That's how it will work out since you started on the center bottom, if you have the same number of holes on each side. You next make a pattern for the handbag, sides which I call the gusset. Draw a seam allowance line on each side. Mark off the same number of holes on that pattern as you made on the front pattern. That gives you the correct length for the gusset. Taper the ends of the gusset to make it narrower near the top on each side. If I made the gusset 4" wide, I would make it 3" wide on the ends. Start the taper about 3" from gusset ends. Ok, now make the back and flap pattern. Draw a straight line on a piece of pattern paper. Lay your front pattern on the paper with the fold you made in it aligned with the line on the pattern paper. Trace the pattern and transfer the hole position marks. This is the back of the bag. Now we add an extension for the flap. Turn your front pattern over as if it were hinged to your pattern paper at the top. Now your front pattern top, is on the top line you traced on the pattern paper with the fold aligned with the line on the pattern paper. Move it 3" up the line... so that the two are 3" apart. This is to allow for the amount of flap you need to go over the top of the gusset. Trace the top pattern again along with 3" connecting lines on each side. Don't mark the holes this time because this is the flap and it doesn't get holes. This flap is actually marked too big, your tracing will show you how long the flap needs to be if you want it to cover the entire front of the bag. The tracing line represents the front of the bag. You can mark your flap shorter and narrower within the traced line and give it any shape you want. After you cut out your pattern fold it in half the same way you did with the front pattern. This will show you if your flap is symmetrical. We know that this pattern will work because of the way we laid it out. The seam allowance lines are the same length and the holes are the same distance apart. I don't mark the fastener hardware location until I make the first bag. The thickness of the leather can change where the flap actually falls. 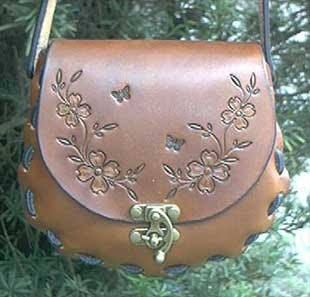 This pattern was made assuming that a firm 5-6 oz leather similar to to that shown in the example above would be used. You should now be able to make this type of bag and assemble it. The strap is just lashed to the top of the bag. You could instead, add a narrow extension to both tops of the gusset to fold around a ring, and either rivet it or lash it down through a couple holes. All you need is the leather and a few hand tools. You could add a pocket to the front or back and fasten the flap down any number of ways. Those are the kinds of changes you can make as the designer of this type of bag. Check out the other designs at the Old School link above to see some variations. Next time we will make a soft bag using a sewing machine. I knew where I can buy the leather handbags at the lowest price from China. There have many kinds of handbags,such as,Genuine Leather Shoulder Bags, Totes, Satchels, Hobos, Cross Body, Travel & Backpacks, Work & Office Bags, Bags for Kids, Leather Cluthes & Purse, mainly in large size with great function and so on. I really enjoy your blog as we are beginning designers and although we are close wtih the manufacturers, I seem to not be conveying my "vision" properly. Do you possibly have a manual or something that I could follow, an example of what an ideal drawing would loook like so that I may follow this as a guide? The gusset seems to never be correct and the top is not sewn correctly, which leaves the shape not as in my vision. I can turn it all in my mind with all the details, but it just isn't coming out that way! any help is great!